Whether You’re Ready or Not, It’s Back to School! Summers in Idaho are pretty incredible. Minus wildfire and construction season. But, with every change in season, comes a change in lifestyle which means we are gearing up for our Back to School Shopping Extravaganza! 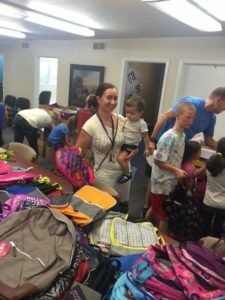 Through the generosity of Scripps Media, Albertsons, and community members like you, our children are able to get a backpack full of many needed school items. This is about more than just the free stuff. These items help children feel prepared and “normal” even if they are living with a foster parent, attending a new school, or whose families are just not able to afford new items. With every box of tissues, glue stick, folder, or ream of paper, you are helping children be successful in and out of the classroom.